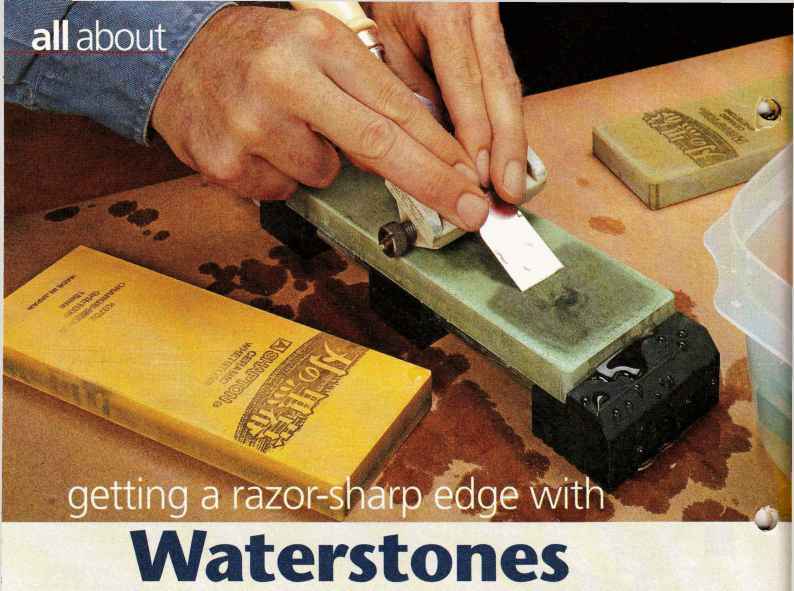 See why waterstones may be the best choice for all your sharpening needs. These handy bits give every woodworker the means to make top-notch raised panels. Cut large coves quickly and safely with this convenient new table saw jig. tips from our shop Shop Notebook. Add some muscle to your miter joints with this simple table saw technique. Clean, accurate mortises with the flip of a switcr — a hollow-chisel mortiser will do the job. Here are some great tips for working efficient. and accurately when making multiple parts. It may sound backwards, but sometimes it's bes: to do the finishing first. We'll share the secret. All you need is a sharp hand plane and the right technique to smooth an assembled frame. The armchairs on page 20 have an interesting story behind them. A few issues back (Woodsmith No. 171), we featured a sliding-top table. And judging from the comments we received, the table is a popular project. When we took the photos of that project, we included some purchased chairs. As it turned out, those chairs sparked a lot of interest, too. So we came up with an easy-to-build chair design. Now, the chairs we originally photographed with the table didn't have arms, but everyone around here liked the idea of adding them. It makes the chair more comfortable. And, if you want to build just one, it will make a nice occasional chair. 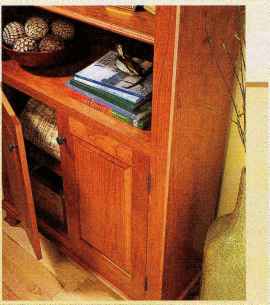 In addition to the chair project, this issue also includes plans for the bookcases shown on the cover and a kitchen project — a set of containers. Besides providing handy storage, they're assembled with a unique, open-miter joint. And it's all done at the table saw. 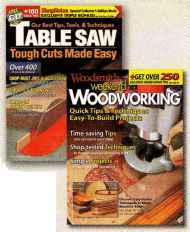 Speaking of the table saw, we just wrapped up our latest book, Table Saw: Tough Cuts Made Easy. In it, you'll find even more tips, techniques, and accessories to get more out of this important tool. 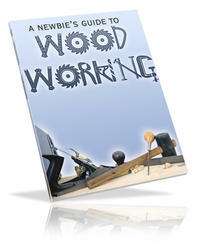 Our other new book, Weekend Woodworking, is dedicated to techniques you can master in less than a weekend. And it provides top-notch plans to put your new skills into use. These two symbols let you know there's more information online at www.Woodsmith.com. There you'll see step-by-step videos, technique and project animation, bonus cutting diagrams, and a lot more. Kitchen accessories never looked so good. Here are three handsome boxes that will give your shop skills a workout and then add some pizzazz to your kitchen. We took one basic case design, combined it with different details and came up with three great projects. Craftsman, country or traditional, you get to make the choice. Routing dadoes and grooves with a shop-made T-square works great. The setup is quick and easy. But most T-squares are usually made for a specific diameter of router bit. The auxiliary router base and T-square you see here solves that problem. This allows me to accurately position and rout four sizes of dadoes and grooves by simply rotating the router. Routing direction from the center as you can see below. 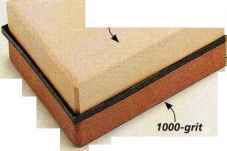 This means each side of the baseplate can be used to rout a different dado. The T-square is simple — it's just a long fence attached at a right angle to a cleat. The cleat holds the fence square to the workpiece. I used the router with the baseplate to rout an alignment notch for each bit size. Each notch corresponds to one edge of the baseplate. The notches are used to accurately position the jig on the workpiece. 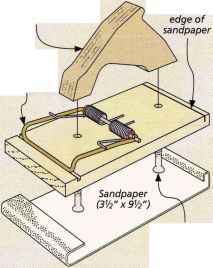 I've always used a scrap piece of wood for a fast and simple sanding block. 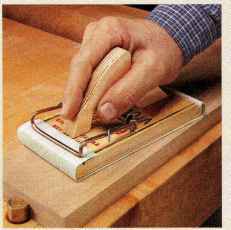 But the sandpaper tends to shift around in use. I looked for a way to hold the sandpaper firmly, and a large spring trap was the perfect solution. #8x1" Fh woodscrew the sandpaper. The spring lever secures the front edge. To give me a better grip on the block, I added a shop-made handle. Be sure to countersink the screws so they won't tear the sandpaper. Woodsmith Tips and Techniques 2200 Grand Avenue Des Moines, IA 50312 Please include your name, address, and daytime phone number in case we have any questions. We will pay up to $200 if we publish your tip. Now you can have the best, time-saving secrets, solutions, and techniques sent directly to your computer. 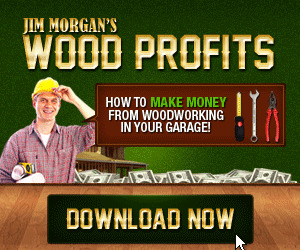 Just go to www.woodsmith.com and click on "Sign Up for Free E-Tips." 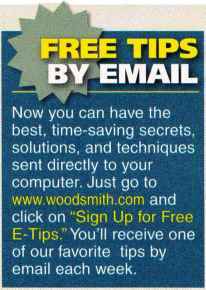 You'll receive one of our favorite tips by email each week. Periodicals Postage Paid at Des Moines, IA. and at additional offices. Click on the link, "MAGAZINE CUSTOMER SERVICE" in the list on the left side of our home page. Menus and forms will take you through any of the account maintenance services you need. After drilling holes in a workpiece, I realized they were too small. I didn't have another workpiece, so I had to figure out a way to enlarge the holes. The photo on the right shows my solution. After covering the top side of the holes with tape, insert the original bit into the holes until the centerpoint punctures the tape. Then align the centerpoint of the larger bit with the holes in the tape, and re-drill the holes. It works perfectly. The sides of each box extend the length of the sawhorses. Slots are cut in the boxes to hold some 2x4s (inset photo). You'll want the boxes to fit snug for stability. 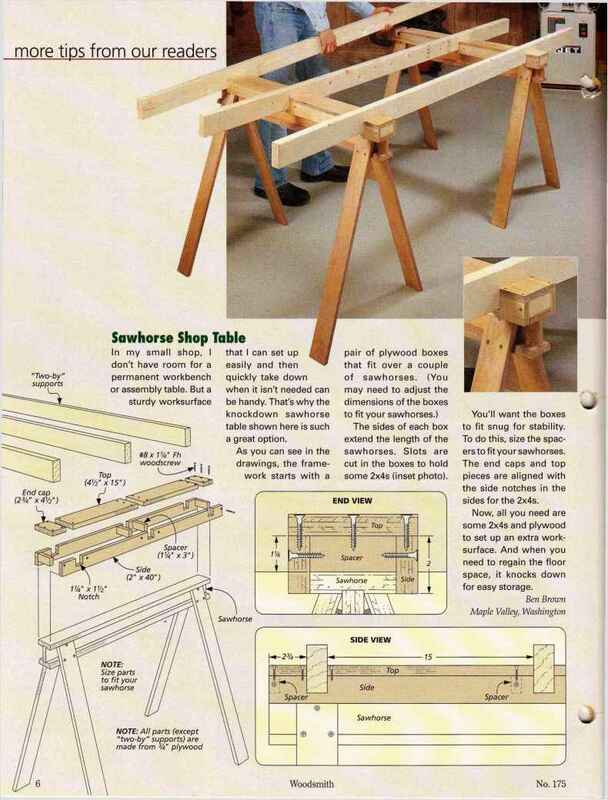 To do this, size the spacers to fit your sawhorses. The end caps and top pieces are aligned with the side notches in the sides for the 2x4s. Now, all you need are some 2x4s and plywood to set up an extra work-surface. And when you need to regain the floor space, it knocks down for easy storage. A project for my shop called for quite a few drawers. I needed a joint that was easy to make but could stand up to heavy use. I decided to cut dadoes in the drawer fronts to acceptthe sides. While this joint is quick and easy to cut, I was worried that the glue wouldn't be enough to keep the drawer fronts secure to the sides. So to "beef it up," I added a set of short dowels that lock each joint, like you see in the photo above. 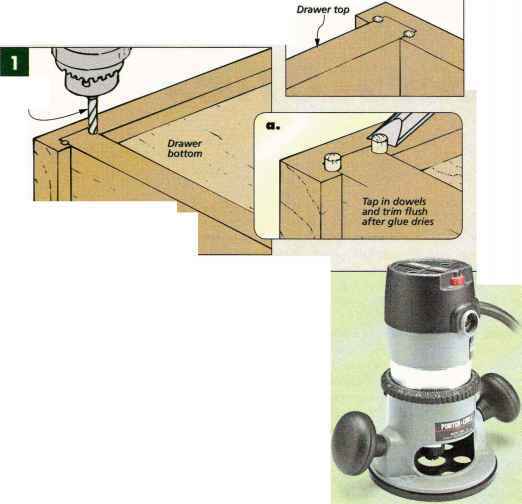 After gluing up each drawer, just drill a couple of holes on both sides of the joint line, as shown in Figure 1. This allows a short dowel to be glued in to act as a "locking" pin. I did this on both the top and bottom of the drawer. 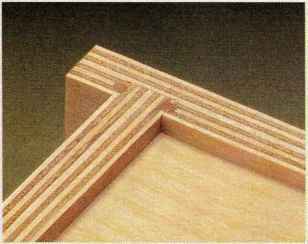 Dado joints can be reinforced with dowels, which also produces a unique "locking" joint. I used a Vs"-dia. dowel for my drawers. It seemed about right for the 1/2" plywood I was using for drawer construction. And don't worry about cutting them to exact length. Just trim them flush with a chisel (Figure 1a). That's right, send us your favorite shop tips. 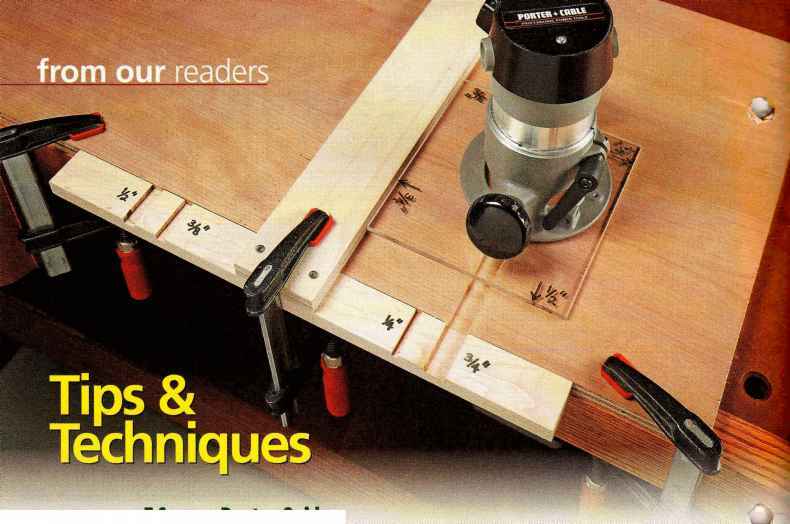 If your tip or technique is selected as the featured reader's tip, you'll win a Porter-Cable variable speed router just like the one shown here. 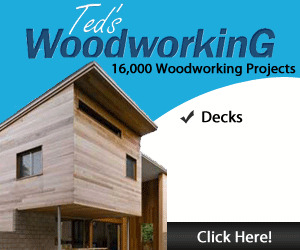 To submit your tip or technique, just go online to www.woodsmith.com and click on the link, "SUBMIT A TIP." You can submit your tip and upload your photos for consideration. I use several pegboard panels to keep tools organized. But I get annoyed when the hooks pull forward and slip out of the pegboard whenever I grab a tool. My solution is to use my staple gun to drive a staple over the top of the hook. It keeps the hook from falling out and is easy enough to remove if I need to move a hook somewhere else. For years, cleaning the waste out of a mortise has been a challenge for me. I would pick away at it with chisels and bang the workpiece against the workbench to shake the shavings loose. Recently, though, I discovered that the hooked end of a paint can opener is perfect for scooping out the waste. It's fast and easy, and I don't have to worry about damaging the walls of the mortise. A magnetic paper clip holder makes a great dispenser for brads. Just give it a shake, and the brads stick to the magnetic ring around the top of the holder. Congratulations to Ben Brown of Maple Valley, Washington. His sawhorse shop table was selected as the winner of the Porter-Cable router. His setup provides a solid foundation for an extra worksurface that's easy to assemble and take apart when no longer needed. To find out how you could win a Porter-Cable variable speed router, check out the information on the left. Looking for a fast, reliable, and affordable way to sharpen your edge tools? Man-made waterstones might be the answer. Natural waterstones often show quarry marks on the edges and underside. 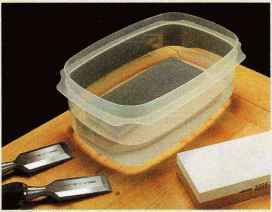 I've tried a lot of different sharpening methods over the years. And they each have advantages and disadvantages. But one of my favorite methods is waterstones. Waterstones are a great way to get a razor-sharp edge on your tools. They cut fast, making them very efficient as well. HISTORY. Japanese craftsmen, like carpenters, swordmakers, and woodworkers, have relied on natural waterstones for centuries to get a sharp edge. Some of the best natural stones have been mined in the mountains outside of Kyoto for more than 800 years. And master craftsmen in Japan still seek out natural stones, like those shown at left. But most of the best locations have been "mined out," making the remaining high-quality stones very expensive. Fortunately, the newer, man-made stones are readily available and are less expensive than natural stones. MAN-MADE ADVANTAGES. As much as natural waterstones are valued by traditionalists, man-made stones have the advantage of being more consistent in grit and structure. They're made by mixing an abrasive compound with a bonding agent. This mixture is then formed into bricks that are fired at high temperatures to fuse everything together into a solid block. When you shop for waterstones, you can assume they're man-made unless labeled otherwise. The most common brands of man-made stones come from manufacturers like King, Norton, and Shapton (shown in the main photo). You can find out where to get them in Sources on page 51. FAST-CUTTING. One reason waterstones have become popular is that they work faster than oilstones. That's because the softer water-stone breaks down faster, exposing fresh abrasive with nearly every stroke. You get the same benefit with man-made stones. An inexpensive plastic container halfway with water works great waterstones before each use. How To Build A TSquare Table Saw? How to build a bookcase using a router? How to create homemade table saw? 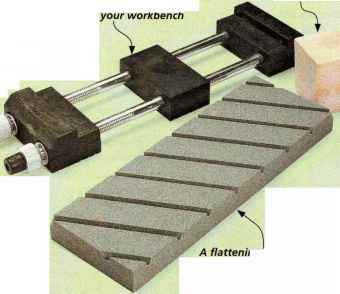 How to make a sharpening stone holder?